Gold Medal Produce owns and operates six units at Hunts Point Terminal Produce Market. We are one of the largest produce houses in the market. Our two main divisions are the Fruit Department, and the Tomato & Vegetable Department. The Fruit Department specializes in Persimmons , Asian Pears, Oranges, Mangos, Apples, Grapes, Tangerines, Papaya, Peaches, Nectarines, Plums, and also features most other types of fruits. 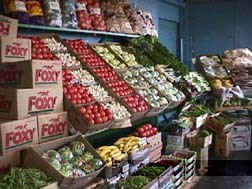 The Tomato & Vegetable Department specializes in Tomatoes, Lettuce, all types of vegetables, and Tropicals. Gold Medal Produce is a family run business with over fifty years of experience, and we continue to grow. Our customer base is made up of fruit stores, supermarkets, fruit stands, wholesalers, and purveyors. Throughout the years we have learned that the key to success is building good relationships. We work closely with our customers to learn what products work best for them. Then we work closely with our shippers and growers to get the right products-- to meet our customers needs..
For many years one of Gold Medal's areas of expertise has been New York's legendary Chinatown District. Chinese Wholesalers and Store Merchants come to us every day to select from the largest variety of Asian Pears and Persimmons in the Northeast. Shippers and growers around the world call Gold Medal Produce when they have good quality and supply of these products.